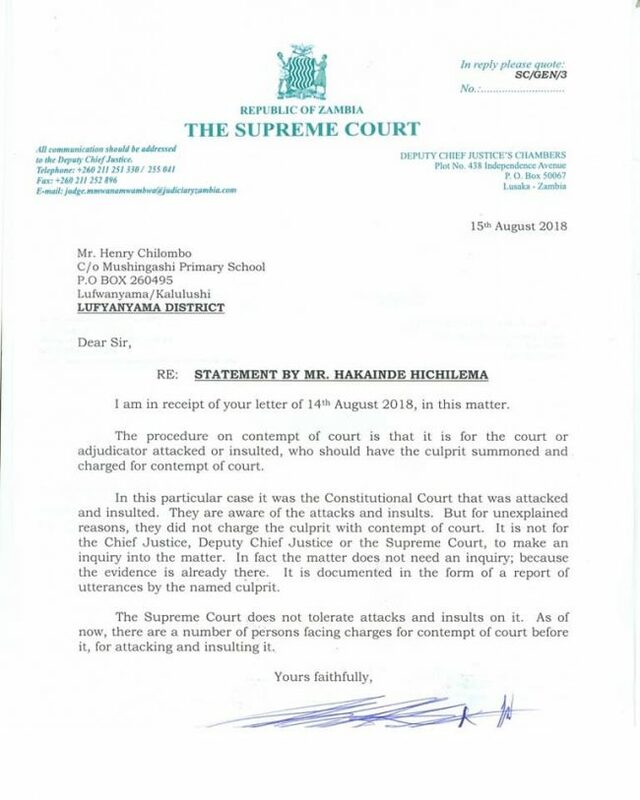 In a letter addressed to Chief Justice Irene Mambilima dated August 14, 2018 a Lufwanyama resident, Henry Chilombo asked justice Mambilima to inquire and investigate the comments made by Mr. Hakainde Hichilema last year towards Judges Palam Mulonda; Anne Sitali and Mungeni Mulenga. Mr. Chilombo stated that he believed that the expressed sentiments against the three judges amounted to contempt of court. Chilombo added that he understood also that Hichilema was wrong to accuse the Zambian judiciary, whilst in South Africa last year of corruption and being under the control of the president. This was a letter by an ordinary citizen written outside the context on any judicial process. Mr. Chilombo does not explain what standing he has which distinguishes him from the other 15 million Zambians. He did not also disclose how whatever outcome of such a weird request for inquiry would personally affect him over and above other Zambians. The inescapable inference is that this letter is orchestrated by someone. It would seem then that this bird that is dancing by the roadside must have some faceless drumbeaters urging it on. Surprisingly, the Deputy Chief Justice decided to engage the private citizen and responded to the letter. Thus, responding to the Chilombo’s letter, Justice Mwanamwambwa in a letter dated August 15 addressed to Chilombo stated that; the procedure on contempt of court was that, it is the prerogative of the court or adjudicator attacked or insulted to have the culprit summoned and charged with contempt. 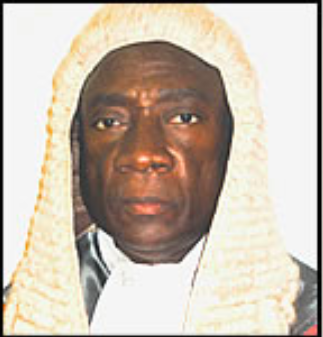 In this particular case, it was the Constitutional Court that was attacked and insulted. Thus the Constitutional Court judges are aware of the attacks and insults, but for unexplained reasons, they did not charge the culprit with contempt of court. In essence, it is not for the Chief Justice, Deputy Chief Justice or the Supreme Court, to make an inquiry into the matter. In fact, the matter does not need an inquiry because evidence is already there – the letter seemed to suggest since it is documented in the form of a report of utterances by the named culprit. Justice Mwanamwambwa went on to say that the Supreme Court does not tolerate attacks and insults on it. Justice Mwanamwambwa went a step further to copy his letter to the Chief Justice and the Director of Public Prosecutions. It is our view that this is an extraordinary letter and we would argue a step without precedent in the common law jurisprudence. It must necessarily be extraordinary because it is a novel procedure for the exercise of the judicial function. We do not make this assertion lightly because the letter not only makes finding of fact, but also gives a verdict without the due process of the law. One would have thought that judges should be the first to insist on ethical rectitude and respect for the settled tenets of due process. It is our view that judges should not be responding to letters concerning matters that are or might come before courts. Judges are oracles of law. They are big masquerades and their best communication to society is through the rigorous respect for due process and judicious use of their judicial powers exercised through judgements upon proper hearing and determination. Hence, Judges should speak only through judgements in dealing with cases that are before them or matters that might come before them. The comments made by the Deputy Chief Justice are not comments made in court when the Deputy Chief Justice is sitting and is empaneled as a court and is exercising judicial powers. The letter gives a legal opinion on a matter that is not before the Deputy Chief Justice. We contend here that judges are prohibited by well-established judicial ethics as articulated in the Bangalore principles of Judicial Conduct and in codes of Conduct developed in most common law jurisdictions. Rule 2. 4 of the Bangalore Principles of Judicial Conduct states as follows: “ A judge shall not knowingly, while a proceeding is before, or could come before, the judge , make any comment that might reasonably be expected to affect the outcome of such proceeding or impair the manifest fairness of the process. Nor shall the judge make any comment in public or otherwise that might affect the fair trial of any person or issues.” According to the Bangalore Principles a judiciary of undisputed integrity is the bedrock institution essential for ensuring compliance with democracy and the rule of law. Even when all other protections fail, it provides a bulwark to the public against any encroachments on its rights and freedoms under the law. Cannon 3A (6) of the 1972 American Bar Association Model Code of Judicial Conduct stated: “A judge should abstain from public comment about a pending or impending proceeding in any court. In the Boston’s Children Case, the US Court of Appeals, First Circuit, observed that: “in newsworthy cases where tensions may be high, judges should be particularly cautious about commenting on pending litigation. Interested members of the public might well consider the Judge’s actions as expressing an undue degree of interest in the case, and thus pay special attention to the language of the judge’s comments.” Comments about a case pending before another judge or jury in the same court or jurisdiction as the commenting judge, can also be reasonably expected to affect its outcome or impair its fairness or at least create that appearance. A rule prohibiting such comments guards against the danger that a judge would feel pressured or would appear to feel pressured by the comments of a superior, peer and colleague or that a jury would accord deference or would appear to accord deference to an opinion expressed by a judge. Moreover, such a rule ensures that proceedings remain immune from outside influences, even if such influences are not specifically prejudicial. The task of judging implies a measure of autonomy which involves the Judge’s conscience alone. Therefore, judicial independence requires not only the independence of the judiciary as an institution from other branches of Government; it also requires judges being independent from each other. In other words, judicial independence depends not only on freedom from undue external influence, but also freedom from undue influence which might in some situations come from the actions or attitudes of other judges. Judicial decision making is the responsibility of the individual judge, including each judge sitting in a collegiate appellant court. In conclusion we advise judges to resist the temptation of engaging the citizenry in the newspapers or responding to letters sent to them by members of the public no matter their motivation. No matter the temptation or provocation, Judges should remember the cardinal rule espoused by the Bangalore Principles and Codes of Judicial Conduct of Common law jurisdictions including Zambia. That rule is plain and simple, and it states that a judge should not make public comments on the merits of matters that might come before any court (his or her court or other courts). Courts are not advisory councils in the business of offering advisory opinions to busy bodies. Theirs is a judicial role given to them by the constitution to judge cases brought before them in accordance with the requirements of due process.